Here is the list of the hotels near Puechredon. Book your hotel near Puechredon today, Thursday 16 May for the best price, reservation and cancellation free of charge thanks to our partner Booking.com, leader in on-line hotels reservation. Below here is the list the 50 closest hotels of Puechredon, sortable according your criteria. You will find the position of these accommodations on the Puechredon hotels map. Offering mountain views, Camping L'olivier in Massillargues-Attuech offers accommodation, a seasonal outdoor swimming pool and a garden. Free WiFi is available. All units come with a terrace with garden views, a kitchenette with a microwave, and a private bathroom with shower. A fridge and stovetop are also offered, as well as a coffee machine. A continental breakfast is available every morning at the camping. Camping L'olivier offers a children's playground. A bicycle rental service is available at this property. Nîmes is 40 km from the accommodation, while Uzès is 39 km away. The nearest airport is Nimes-Ales-Camargue-Cevennes Airport, 53 km from the property. Offering an outdoor pool, a restaurant and free WiFi throughout, camping le Fief d'Anduze is located in Anduze. The accommodation will provide you with a terrace and a seating area. There is a full a kitchenette with a refrigerator and kitchenware. You can enjoy garden views from the rooms. Extras include a sofa and an outdoor seating area. At camping le Fief d'Anduze you will find a garden, a bar and a snack bar. Other facilities offered at the property include entertainment staff, a nightclub and a games room. An array of activities can be enjoyed on site or in the surroundings, including hiking. Offering free private parking, this camping site is 69 km from Montpellier - Méditerranée Airport. Located in Tornac, Mas des Tours offers accommodation with seating area. Free WiFi is featured. All units are equipped with a flat-screen TV and a fully equipped kitchen with a dishwasher. An oven, a microwave and toaster are also available, as well as a coffee machine and a kettle. Various dining options including Mediterranean and French cuisine are available at the on-site restaurant. The holiday home offers a barbecue. Mas des Tours has a garden and sun terrace, which can be enjoyed by guests if the weather permits. Nîmes is 43 km from the accommodation. Nimes-Ales-Camargue-Cevennes Airport is 57 km away. Le Coing des Vignes is located in Mauressargues, 53 km from Montpellier. The bed and breakfast has an outdoor pool and sun terrace, and guests can enjoy a meal at the restaurant. Free private parking is available on site. The rooms are equipped with a flat-screen TV. Certain units include a seating area to relax in after a busy day. For your comfort, you will find slippers and a hairdryer. Le Coing des Vignes features free WiFi throughout the property. Guests can enjoy various activities in the surroundings, including cycling and hiking. A visit of the area in Citroën 2CV with a private driver is also proposed at an extra cost. 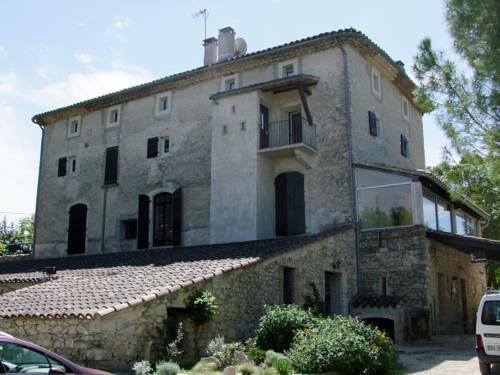 The property is located 26 km from Nimes, 21 km from Anduze and 27 km from Uzès. Just a 20-minute drive from Le Coing des Vignes guests will find the Cévennes National Park. The nearest airport is Nimes-Ales-Camargue-Cevennes Airport, 30 km from Lthe property. Located in Tornac in the Languedoc-Roussillon region, Wohnung Serena has a terrace. Guests staying at this apartment have access to a fully equipped kitchen. Offering 3 bedrooms and 1 bathroom with a bath, this apartment is equipped with a satellite flat-screen TV. Nîmes is 42 km from the apartment. The nearest airport is Nimes-Ales-Camargue-Cevennes Airport, 56 km from the property. Hôtel de la Madeleine is located 2 km from the centre of Anduze and a 15-minute drive from Alès. It offers an outdoor swimming pool, an on-site art gallery and a potery workshop. Free Wi-Fi access is available throughout. The air-conditioned guest rooms at Hôtel de la Madeleine include a flat-screen TV with satellite channels. They each have an en suite bathroom with free toiletries and a bath or a shower. A buffet breakfast is served every morning and guests can also enjoy breakfast in the comfort of their room. Pottery classes are organized on site and local ceramic artwork is sold in the hotel’s shop. Free private parking is provided at the hotel. The property is set on the edge of Cévennes National Park, a 45-minute drive from central Nîmes and the A9 motorway. Located in Les Tavernes, Villa Lauralie provides accommodation with a private pool, free WiFi and private parking. This holiday home offers accommodation with a terrace. The holiday home includes 4 bedrooms and a kitchen with a dishwasher and an oven. A flat-screen TV with satellite channels and a DVD player are featured. Nîmes is 37 km from the holiday home, while Uzès is 35 km away. The nearest airport is Nimes-Ales-Camargue-Cevennes Airport, 50 km from Villa Lauralie. Located in Bagard, Three-Bedroom Holiday Home in Bagard provides accommodation with a private pool. Complimentary WiFi is offered. The holiday home is fitted with 3 bedrooms, a TV and a fully equipped kitchen that provides guests with a dishwasher and an oven. The holiday home offers an outdoor pool. Nîmes is 42 km from Three-Bedroom Holiday Home in Bagard, while Uzès is 39 km from the property. The nearest airport is Nimes-Ales-Camargue-Cevennes Airport, 55 km from the accommodation. Holiday home Chemin De Veyrac is located in Anduze and has a private pool, a kitchen and mountain views. The property is 4.1 km from La Bambouseraie Botanical Garden. The holiday home is equipped with a TV, 4 bedrooms and a living room. The holiday home offers an outdoor pool. Nimes-Ales-Camargue-Cevennes Airport is 57 km from the property. Featuring a garden and a terrace, Appartement Chez Gilly offers accommodation in Boisset-et-Gaujac with free WiFi and mountain views. Guests staying at this apartment have access to a fully equipped kitchen. The property includes a living room with a flat-screen TV. Nîmes is 43 km from the apartment, while Uzès is 39 km from the property. The nearest airport is Nimes-Ales-Camargue-Cevennes Airport, 57 km from Appartement Chez Gilly. Chambre d'hôtes Chez Gilly is situated in Boisset-et-Gaujac. It has mountain views and free WiFi. Leading onto a terrace, the holiday home consists of 1 bedroom and a fully equipped kitchen. The accommodation also offers 1 bathroom with a shower. Nîmes is 43 km from the holiday home, while Uzès is 39 km from the property. The nearest airport is Nimes-Ales-Camargue-Cevennes Airport, 57 km from the property. Located 2 km from Vézénobres, Au Fil de Soi offers an outdoor, swimming pool, table tennis facilities and a garden with terrace. Massages can be arranged at an extra cost and free Wi-Fi is provided. The guest room comes with garden views, a bathroom with bathtub or shower, free toiletries and hairdryer and a wardrobe. Every morning, guests will enjoy a French pastries, homemade bread, jam and yogurt for breakfast. Meals can be prepared by the host upon request and the property offers an outdoor kitchen. Restaurants and supermarkets can be found just 2 km away. Guests can visit a local market in Vézénobres every Thursday. The guest house has a children’s playground and pétanque facilities. Pont du Gard is 10 km away. Alès Train Station is 10 km away, while Nîmes Airport is 40 km away. L'Oasis de Boisset is a 5-star awarded holiday home with a seasonal outdoor pool and exterior hot tub, set in Anduze, 3.4 km from La Bambouseraie Botanical Garden. The holiday home is equipped with air conditioning and free WiFi. Free private parking is available on site. A dishwasher, an oven and a microwave can be found in the kitchen and there are 2 private bathrooms. A flat-screen TV with cable channels, as well as a CD player are available. Other facilities at L'Oasis de Boisset include a barbecue. You can play table tennis, pool and table football at the property, and free use of bicycles is available. The nearest airport is Nimes-Ales-Camargue-Cevennes Airport, 46 km from the property. Set in Anduze in the Languedoc-Roussillon region, B&B La Bastide St Julien offers accommodation with free WiFi, as well as access to a hot tub. The accommodation has a hot tub. Fitted with a terrace, the units feature a flat-screen TV and a private bathroom with free toiletries. A continental breakfast can be enjoyed at the property. Guests can also relax in the garden or on the shared lounge area. La Bambouseraie Botanical Garden is 4.3 km from the bed and breakfast. The nearest airport is Nimes-Ales-Camargue-Cevennes Airport, 59 km from B&B La Bastide St Julien. Le chalet porte bonheur is set in Vézénobres and offers barbecue facilities, a garden and a terrace. The chalet is in an area where guests can engage in activities such as fishing and hiking. The chalet features 1 bedroom, a flat-screen TV and a fully equipped kitchen that provides guests with an oven and a microwave. Guests at the chalet can enjoy a continental breakfast. Guests can make use of the hot tub. Nîmes is 34 km from Le chalet porte bonheur. Nimes-Ales-Camargue-Cevennes Airport is 47 km from the property. Situated within 3.6 km of La Bambouseraie Botanical Garden in Anduze, Gîtes du Mas Icard provides accommodation with free WiFi. The units come with a kitchen featuring coffee machine and a dining area, a living room, and a private bathroom with a hair dryer and shower. A dishwasher and kettle are also provided. Nimes-Ales-Camargue-Cevennes Airport is 59 km from the property. Below here is the hotels map of Puechredon. Names and details of Puechredon hotels can be shown on the map clicking on the prices icons.